Despite not having enough time to create an all new built-from-scratch airliner template this week, the one that I’m posting today is something that satisfies me to the core. You see, the DC-10-30 was the very first aircraft template that I ever created (way back in 2012 or 13), and…well…I didn’t do a very good job on it. The proportions were off, the shading was all wrong, and the details were “just a guess” to put it mildly. I didn’t do the proper amount of research before starting that one to make it as accurate as possible, but I sure was proud of it at the time. It didn’t take long for me to pour obscene amounts of perfectionism into every template that I did after that one, and unfortunately, I was moving so fast with new template creation that the DC-10 got left in the dust. “I’ll fix it later” I always told myself, but the years rolled past and at the beginning of this year I was starting to realize that it had become an embarrassment to my portfolio. That embarrassment increased tenfold when I created my MD-11 template earlier this year – it was then when I realized just how bad it really was. I’ve already gone back and updated my old DC-10-30 template here on my blog and on my store, so there’s no point in going back and seeing for yourself how much of a disaster it was. But I’ll let you in on a little secret: all of my old DC-10 livery illustrations (United, Pan Am, Hawaiian Airlines, etc) are still alive and well here on Norebbo.com and they are all based on that old and ugly template. Yeah, I’d love to go back and update those old renderings, but I don’t think it’s going to happen any time soon. There just aren’t enough hours in the day, especially if y’all want me to keep plowing ahead with new aircraft types. Besides, leaving my old (and really embarrassing) artwork in place isn’t all that bad – we are all human after all, and it’s neat to leave a trail of progress behind just to show how much we’ve improved over the years. 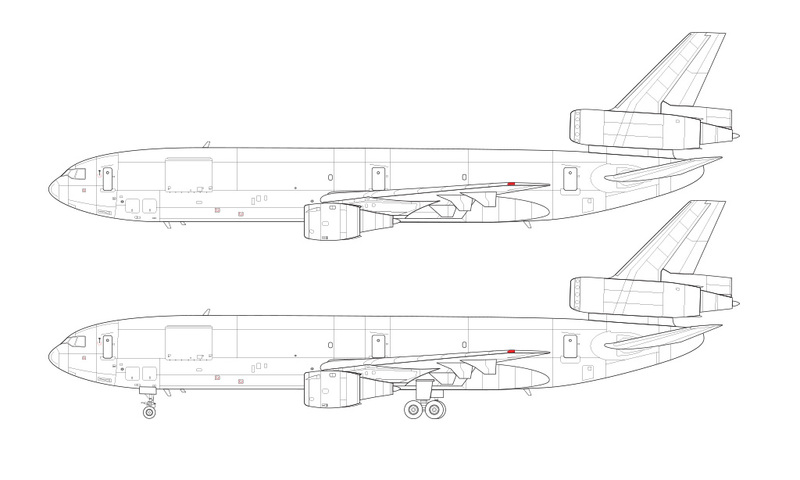 Anyway, going back and cleaning up my old DC-10-30 illustrations was immensely satisfying. It was so satisfying as a matter of fact, that I decided to go ahead and create templates of the DC-10-30F as well since it’s a very common freighter in today’s air cargo market. It’s a template that I’ve had many requests for over the years, and I’ve always been meaning to get to it – but only after I cleaned up the base template first. So here it is! As a bonus, here’s a bare aluminum version. Yeah, I probably over-exaggerated the hard reflections, but I thought it looked really strong this way so I left it. Note that you can reduce (or remove) the reflections completely in the PSD file. 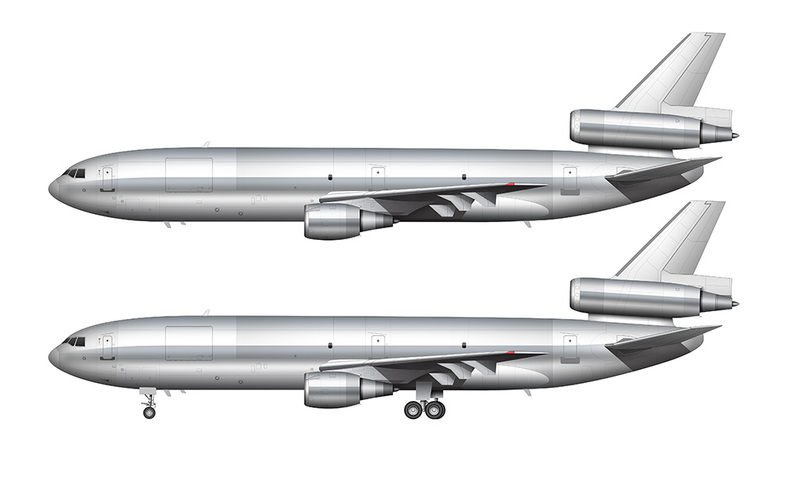 One of the more interesting things about the DC-10-30F is that it’s nearly identical (on the outside) to the MD-10. For those that don’t know, the MD-10 is an aftermarket cockpit upgrade on the original DC-10 models which makes them technically identical to the MD-11. This was a really big deal for FedEx, since it allowed pilots of each aircraft type to be able to fly both. 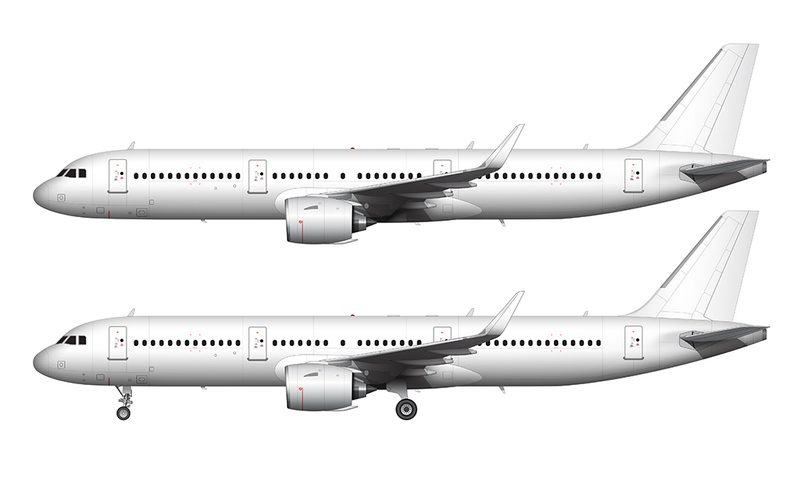 As far as I know, there are no major external visual differences between the DC-10 and MD-10, so you could use this template for both types. Anyway, I realize that this won’t be a very exciting post for most of you, but it feels really good to be able to go back and clean up my worst set of illustrations in the entire Norebbo template collection. And now that I’ve got this out of the way, the big question is: what’s next? Actually, I think I’ll going to leave it up to you! If you had to choose between the Saab 340 and the Dornier 328, which would it be? You’ve got one full week to cast your votes. I’ll be starting the new template next Tuesday, and the one that has the most votes between now and then will be the one that I plow forward with. I’m actually very excited to do both, but I’d be much more comfortable doing the one that has the most demand at the moment. Please let me know which one you want to see first! 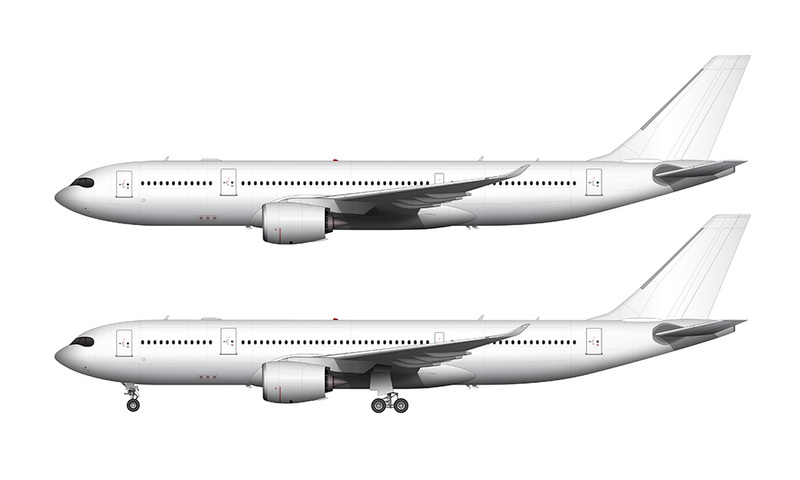 What about the A340-200? You’ve done the -300/-500/-600, but missed that one. Thanks for being the reminder – I totally forgot about that one! It wouldn’t be a DC-10 without a bare aluminum version. 🙂 And thanks for your vote – the Saab 340 is winning so far! Could you please make some Russian planes? Like the Antonovs, Tupolevs, Ilyushins, Yakovlevs and Irkuts? And maybe also the Comac C919? Definitely! I am planning on starting some Russian aircraft soon, and I’ll eventually do them all. Thanks for your vote Peter! Well, I’m ready to start the next template today and it looks like the 340 won. This is going to be fun!